For an embarassingly long time, we had a footstool in the media room which consisted of a big throw pillow set atop a cardboard box. We were on our second cardboard box. 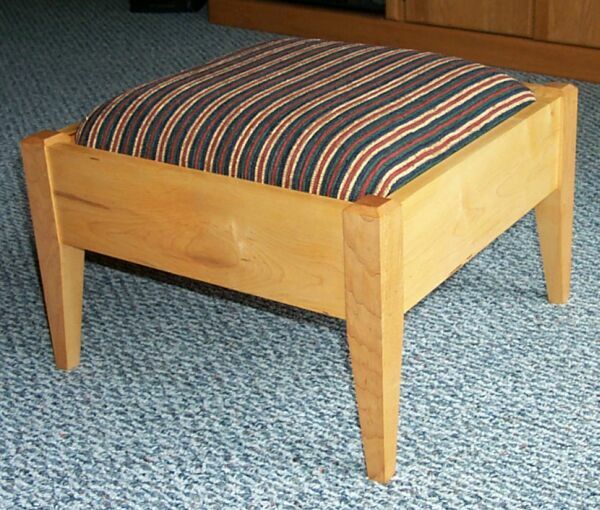 I finally got ambitious and built this footstool to replace the unsightly kluge. I don't really have much to say about the construction. It's made of Western maple. It's my own design, but it's so traditional that it hardly seems worth claiming it. Four aprons mortised and tennoned into four legs. Tapers on the insides of the legs, bevels on the tops. It's finished with a couple of coats of boiled linseed oil topped with 4 or 5 brushed coats of blonde Paddylac, rubbed out dry with 0000 steel wool and finally waxed. It didn't take too long to make the wooden parts, probably 2 or 3 weekends of part-time work. What took forever was first figuring out how to make the upholstered top, then actually getting up enough confidence to actually do the work. I think I spent 3 or 4 months on that part ;-) Once I sat down to do it, I had the cushion together in about an hour. The oldtools list was invaluable in teaching me how to do the cushion. I asked and they explained at length. Rachel bought the cool fabric for me.